In my previous article, Lightroom 3 was the clear winner over Adobe Camera Raw 5.7. But, now that CS5 has been released, there is a new Bridge and ACR in town. 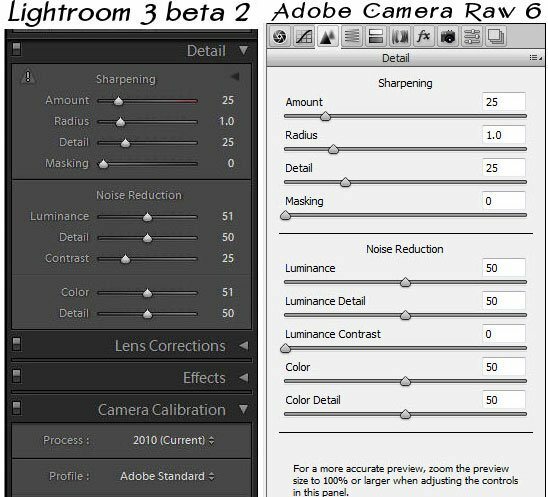 Adobe is using their new Noise Reduction algorithm in both Adobe Camera Raw 6 and Lightroom 3. But, would Adobe hold back to force photographers into LR3? Take a look. I used the same Canon 7D Raw file from my previous article. Again, this file was shot as 18meg Raw file with ISO 6400, f/4.0, 1/125 shutter, available light and in-camera noise reduction turned off. (Adobe ignores Canon’s Noise Reduction setting anyway when processing a Raw file.) As you can see from the above samples, they are virtually identical and took seconds to accomplish. I have been dying to do this comparison. I am very impressed with CS5 Bridge and ACR6. Adobe has packed more of the Lightroom’s batching features into Bridge. Before you purchase Lightroom3, you must take a look at CS5 Bridge! I do a lot of landscapes and my “go to” lens is a Tameron 17-50 2.8 which has f13 as it’s sweet spot so I try to keep the lens at that setting. Of course that makes me use a tripod a lot of the time. So far I’ve noticed that the shots I’ve taken with the 7D using f13 are not very sharp. I see your images at f4 look sharp, have you tried higher (greater than f6.7) aperture much? If so, are your shots sharp? Have you ever read about Hyperfocal Distance? There are several good articles on the web about it. Basically, there is a point were “sharp” focus combined with the right f-stop can achieve almost infinite depth of field. When the f-stop is smaller than that point, the “slow light” can actually induce blurriness. With landscapes and other scenes, I try to shoot with an f-stop around f/5.6 or f/8 for maximum depth and sharpness. I used to shoot regularly with f/16 and f/22 but found those images to not be as sharp. But, with digital cameras, it never hurts to experiment with different f-stops for the same scene.